So yesterday my mate Sy completed the 2010 London Marathon in 4 hours and 9 minutes. He was hoping to do 3.45 but was badly affected by cramps at 18 miles. Nevertheless, what a phenomenal achievement for Sy who less than a year ago was 5 stone heavier! Wow, what a guy! So far Sy has raised £3,136 for Children with Leukemia. Marathon running is a real endurance sport and I'm completely in awe of the elite sports men and women who put themselves through such vigorous training and physical challenges to be amongst the most revered athletes in the world. 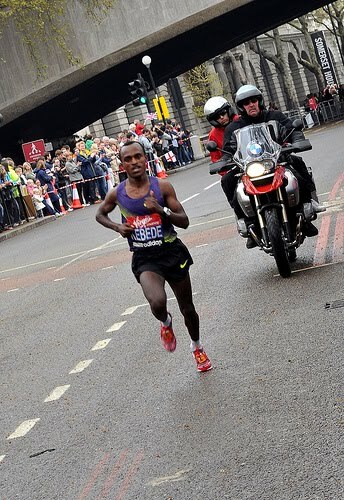 Yesterday the London Marathon was won by Tsegaye Kebede of Ethopia in a time of 2 hours, 5 minutes and 18 seconds - that's about the time I take to do the washing up on one of my less enthusiastic days. On the left is Sy after completing the marathon and wearing his winner's medal. He looks a bit wobbly to me as if he's about to topple over! Unfortunately for us, Mrs Sy couldn't find him in crowds to take those piccys I was really looking forward to - those ones with his tongue hanging out and doubled up with cramp! Hmm..pity..those ones are always good for the scrapbook! Well done Sy, Tsegaye and the late, great Sammy Davis Junior! Without champions like you, the world would be a much duller place! Did you know that Tsegaye threatened to pull out when he heard I was running too? Yeah, he cant handle real competition can he! Right. I am off to listen to the somg "The Candyman". Why? Coz it's Sammy's best song!